Do you hate making lists and want to make the most out of your meal prep time? Well we have an app for you! Living off campus as a college student comes with its own difficulties, one of which is having to cook your own meals. In order to make meals for the whole week in an efficient manner, meal prep becomes necessary! I'm personally not a huge fan of lists; however, I will use them if I have them! And, when it comes to meal prep, shopping lists can be pretty helpful! MealPrepPro is a mobile application used for meal prep. It gives you various fields, such as Recipe, Ingredient, and Cost which are used to search through a database of recipes. 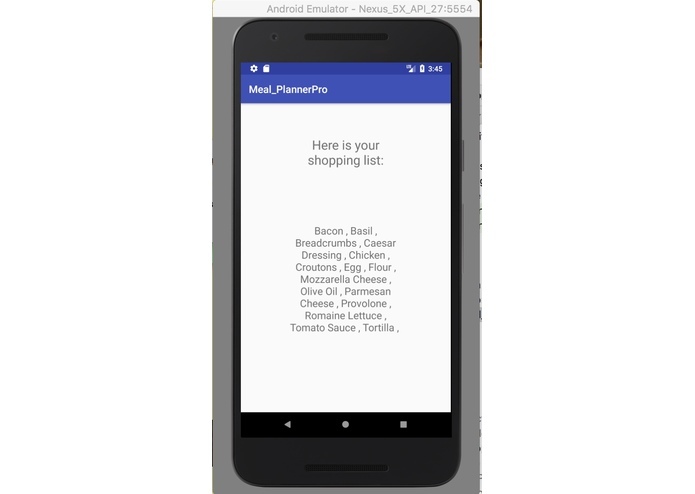 It then tells you the recipes that fit the criteria it was given and allows you to see an ingredient list (shopping list). 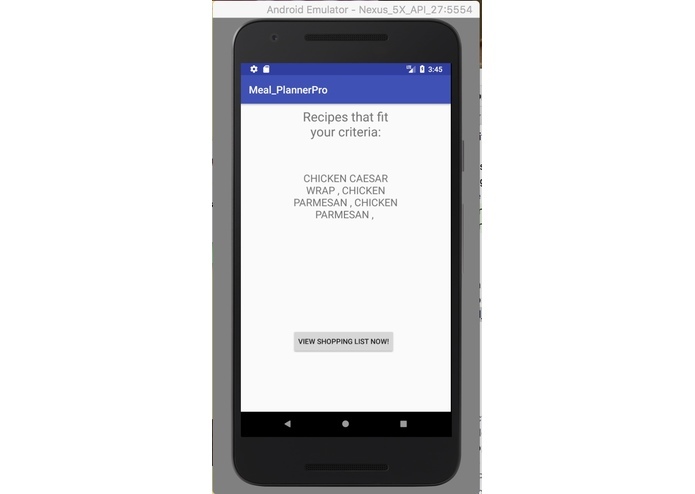 We built MealPrepPro using Google Firebase and Android Studio. The Database that we used to store the recipes was a Google Firebase database in JSON. And, the whole app was tied together by coding in Java. We took a different approach than normal on this project and actually used Pair Programming (sometimes referred to as Peer programming). This allowed us to work through coding and logic errors faster and we were able to evenly distribute the workload. Neither one of us had any experience using Google Firebase. One out of the two of us had some exposure to databases; however, neither of us had any experience with JSON databases. We ran into some issues when it came time to connect the interface to the database; but, eventually figured it out (Special thanks to Geoff at Niche and all of the mentors for your help)! We are proud that we were able to learn some new skills. We built a simplified version of an idea that we had using Google Firebase which neither of us had any experience with. 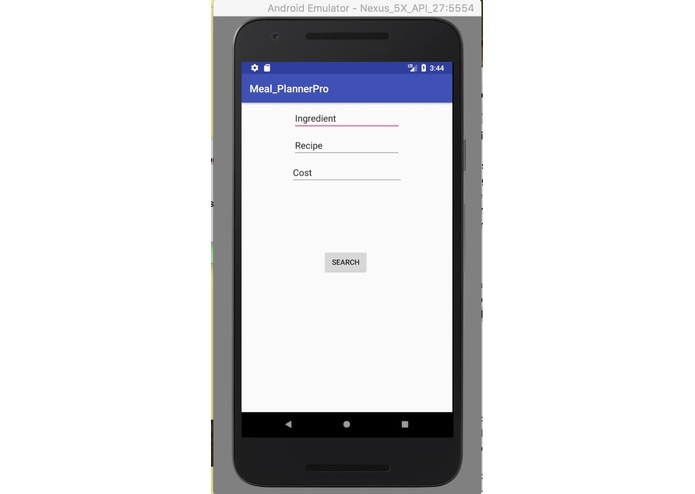 We learned some Google Firebase, working with Firebase Database, incorporating databases into mobile applications, JSON, working with mobile applications, using android studio. MealPrepPro has a bright future. I'm very excited to continue working on this project and adding more features to our simplified version. In the future, we hope to add the ability to filter through recipes differently (by using tags such as gluten-free, vegan, vegetarian, etc.). Also, to be able to filter through recipes by using your favorite ingredients or by the number of meals you would like to create. The ability to search through your "favorite" recipes (such as recipes saved on Pinterest/E-Cookbook) or recipes with high ratings from your friends or family. Also, on the 2nd page of the App, we hope to incorporate clickable widgets in order to select the recipes you would like for the week. And, a strick-able list option for your shopping list, in order to check off the items as you purchase them (or check off the items you already have before you leave to go shopping). An additional feature, that we would like to add would be the ability to search the stores nearest you to find the best deals for the items on your shopping list. Then you would be able to pick how many stores you would be willing to go to and it would tell you the items to buy at each store in order to be the most cost-effective.